I've come to really look forward to Tuesday's. :) Yesterday for Terrific Tuesday, we decided to visit my mom (aka: Granny Goose) at the elementary school she teaches at. 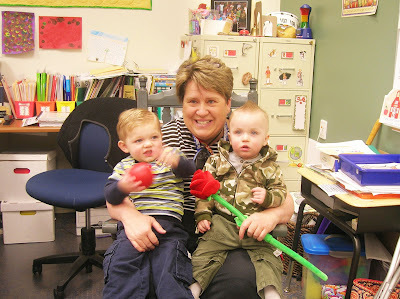 She is such an amazing teacher and is so great with kids. Her school is connected to the school district offices, so we headed over there to eat lunch in their yummy cafe. 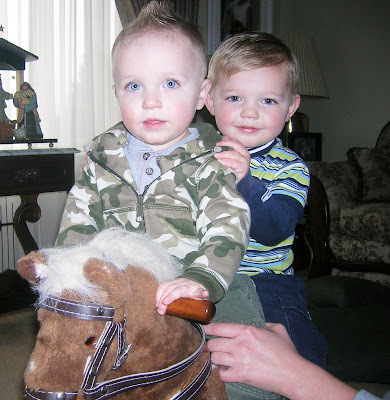 Afterwards we went to Granny Goose's house to let the boys play. They are best buddies and are learning how to share. Tuesday evening for Young Women's we went sledding. I have always wanted to serve in YW's and was so excited when my wish finally came true a couple of months ago when I was called to be the Laurel advisor, which means I teach (my favorite!) most Sunday's. 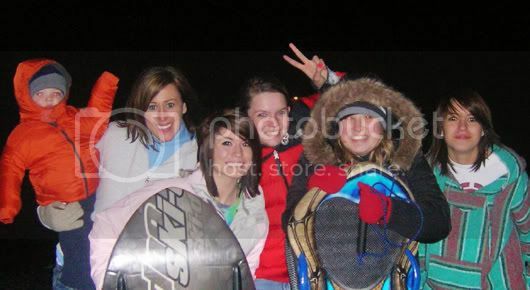 We went sledding in the dark and had such a fun time. Bryson came along and enjoyed flirting with all of the pretty girls. Then Bryson and I drove to the airport to pick up daddy. He's been down in New Mexico/Arizona helping his grandparents move and we are SO EXCITED he's home!